For more yummy recipes and other easy meals that I have on my blog, head over to here. For those of you who struggle with meal planning or for you busy moms, Six Sisters’ Stuff has a weekly menu plan with family-friendly meals for just $48 a year. That turns out to be only $4.00 per month! There are four Six Sisters’ Stuff Menu Plan options to choose from, and with the menu plan, you’ll receive a week’s worth of meals at a glance, which includes 6 main dish recipes, 2 side dish recipes and 2 dessert recipes. And in addition to getting a menu plan, you’ll also receive a detailed shopping list of what to buy each week. Head over here get the Six Sisters’ Stuff Menu Plan or to find out more details. If you know you will have a busy week, then plan more simple meals. I always have a few simple meals on hand that I add to my menu each week. I like that I have a list of meals and and food in my pantry to cook the meals, yet I also like that there are easy meals to whip together on days when I’m really busy. In addition to planning meals around my week, I also plan meals based on what’s in season and what’s on sale at the grocery store. For instance, if broccoli is on sale, then I will make Chicken Broccoli Casserole, as well as add broccoli as a side dish to one of the other meals. If pork chops are on sale, then I’ll make Ranch Crock Pot Pork Chops. And if tortillas are on sale, then I’ll make Chicken Enchiladas or quesadillas. Also plan meals based on what you already have in your kitchen. For ingredients you have on hand or haven’t used, look at sites such as Allrecipes.com or SuperCook.com, type in what ingredients you have, and it will bring up new recipes with those ingredients. This is a great way to not let food go to waste. To save time before you start making dinner, prepare meals or ingredients ahead of time such as placing frozen items in the fridge to thaw or cut up vegetables the night before. If I have meals that use shredded chicken, I’ll plan ahead during the week and fill my crock pot with frozen chicken, let it cook all day, and then shred it. This gives me enough chicken for multiple meals during the week. Plus, I usually have extra that I can freeze and pull out for meals later. If you plan on repeating a meal again the following week, make a double batch of that night’s dinner and freeze one, then the next week you have a meal all ready to go. I like to have a few freezer meals that I can pull out of the freezer each week. Check out these 7 Make Ahead Freezer Meals and these 12 Favorite Freezer Meal ideas that my family enjoys. I usually decide each morning what meal I want to make for dinner. This helps me to know if there are ingredients I can prepare early in the day, or if I have a busy day, then I can throw a meal in the crock pot so it’s ready for dinner. By preparing items in advance, it makes the whole dinner process much easier. Because I plan my meals two weeks at a time, I only grocery shop once every two weeks. This saves me from making multiple grocery store visits every week, which saves me money. Read about how I buy groceries on budget here. After you’ve created your menu, make a list of all the ingredients that you will need to prepare these meals. So you don’t have to start a new list each week, keep a generic list on hand that includes things you buy frequently such as milk, eggs and bread, then add items to the list. If you already have an item in the refrigerator or cupboard, then cross it off the list. This will save you money because you won’t need to buy something you already have on hand. I keep my grocery list on my computer and add items to my generic list before I go shopping. In addition, I arrange the items on the list to correspond with the layout of the grocery store so I don’t need to go back to an aisle again, which makes shopping easier and faster. I’ve been asked many times how I only shop every few weeks and still have fresh produce. What I do is buy enough fresh produce that my family will be able to eat, and then for the first week I use up the items that will perish first, such as bananas and berries. With the produce that lasts longer such as lettuce (wrap it in paper towels to last longer), carrots, apples and oranges, my family will eat them more during the second week. And as my fresh produce runs low, I incorporate frozen and canned vegetables, as well as fruit I canned in the fall, into my meals. I try to purchase enough produce to eat healthy but not too much that I end up throwing it out. After you make a meal, decide if it’s a meal you want to make again for your family, and write it down on a list with other meals that you want to cook again. Building a collection of delicious, family-approved meals will help your meal planning take less time. 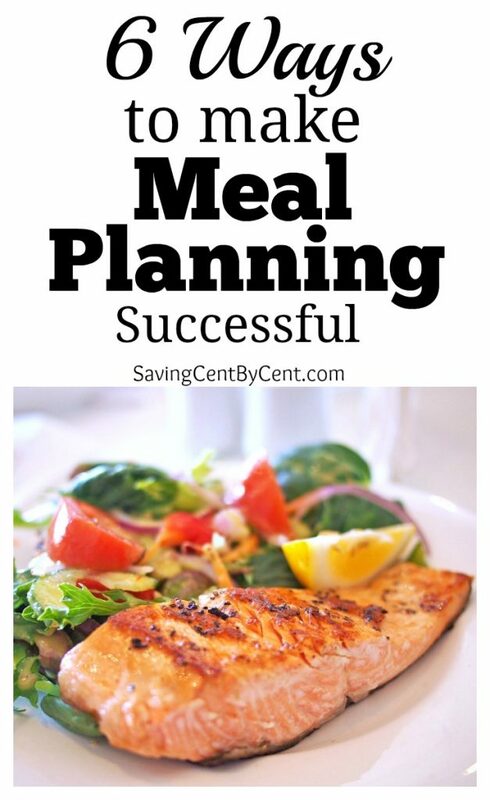 What are ways you make meal planning successful?